PRODUCT: Retro-Spin® / Retro-Collar Kit. Consists of ASI# 702121 galvanized steel Retro-Spin Flashing base and #703319 1.66" ID EPDM Retro-Collar Assembly (wrap-around flashing skirt + top plug), and stainless steel marine grade band clamp. Fits 1.25" ID pipes which are 1.5 to 1.67" OD & DN32 pipes. Price/Kit. APPLICATIONS: A waterproofs roof penetrations that do not allow for “slip over the top” installations. 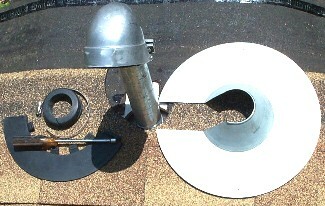 The Retro-Spin® Flashing assembly is constructed of a tightly fitted interior, and exterior, impact extruded roof jacks. The patented Retro-Spin® design enables the interior flashing to rotate freely within the confines of the exterior flashing. Retro-Spin® Flashings are fabricated in the United States from first quality electro-galvanized sheet metal. The life expectancy of a Retro-Spin® Flashing should exceed 20 years. The EPDM Retro-Collar consists of two pieces. Each piece wraps the pipe, snaps closed around the pipe, then interlocks to each other to form the waterproof system. INSTALLATION: See the installation instructions on our information page.